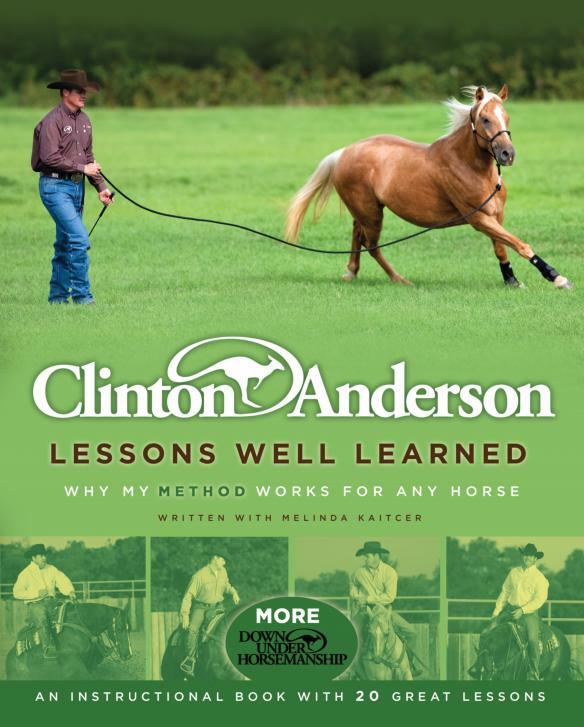 Clinton Anderson's Lessons Well Learned - "why my method works for any horse". An instructional book with 20 great lessons from Downunder Horsemanship! Frustrated by a horse that is lazy and slow to learn? Frightened by an aggressive and disrespectful mount? Unsure of how to take your good show prospect and make him great? This one of a kind book dishes out sensible solutions to all these common problems and more - as Clinton guides you through the best ways to become a more confident, efficient and proactive horseperson. It is in the spirit of "teaching people" as much as "training horses" that Clinton now shares 20 of the most valuable lessons he has learned - from horses and those that work with them - throughout his career. His theory is that if you know how he learned - just a regular old kid with a passion for horses and a desire to work with them - then you too, regardless of your age or experience, can reach the next level of your horsemanship. You'll discover how to create the perfect balance of sensitising and desensitising exercises; move your horses feet at the right time for the right result; choose the best horse for you, and to accelerate your horses learning by allowing a mistake to happen then fixing it. With over 100 exciting photos and loads of practical information - it is Clinton's hope that the lessons he learned with help you achieve the same fantastic success with horses.